Back in the late 1950s and early 60s, when bachelors were luring secretaries up to their "pads" to impress them with their new "hi fis" (Mike Nichols and Elaine May did a great comedy sketch about that), conductor Morton Gould's name was a familiar one. Like Arthur Fiedler – both were recording artists for RCA Victor – Gould comfortably crossed between the classical and popular genres, and he always seemed to be at the forefront of sonic innovations of one sort or another. (There was a Bolero for RCA Victor which breathlessly advertised not one but two drums!) Most of the time, however, the innovations were related to recording technologies, and Gould was firmly on board during the era of "RCA Living Stereo." Something of that sonic razzle-dazzle is present on the current ReDiscovery reissue. 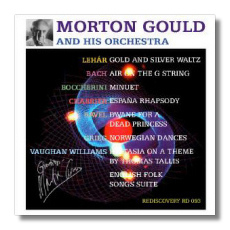 Lehár's Gold and Silver Waltz is nothing if not resonant (these are Hollywood Bowl-style acoustics), and Bach's Air on the G String, as played by Gould, seems to have been destined for the soundtrack of a Stanley Kubrick film that never was. Although Gould generally was not a controversial conductor (yet see below), he made his performances distinctive through unanticipated subtleties. The Boccherini Minuet is unexpectedly cute, and Chabrier's España abounds with chunks of garlic and red pepper. With the blink of an eye, though, Gould captures the gravity of Ravel's Pavane without becoming bathetic, and Grieg's Norwegian Dances are full of unaffected nationalistic spirit. At the time, Gould's version of Vaughan Williams' Tallis Fantasia drew howls from some quarters, including from critic William Flanagan, who, according to ReDiscovery's annotations, called it "souped-up," continuing, "One does not probe the Thomas Tallis Fantasy for Tristanesque climaxes and lard its textures." My reply to that is, "Why doesn't one?" All kidding aside, this is a terribly Romantic and unbuttoned interpretation of this work, but dull it's not, and like Dimitri Mitropoulos' recording of the same work, it does something with the music – whether one likes it or not – that few conductors have dared to try. The sound on this release, like the performance of the Tallis Fantasia, borders on the self-consciously spectacular, although sometimes the climaxes are a little cluttered. (This is particularly true in España.) Nevertheless, this is a powerfully enjoyable CD, even if the original program probably was put together for people who might not have had much of a taste for classical music. The all-Bianca release contains somewhat older material – all from the mid 1950s, I am guessing. (During this decade, she was a prolific recording artist in Hamburg, and made quite a few LPs for different labels.) These recordings obviously are very dear to the folks at ReDiscovery; this time around, there's even a real booklet, including a statement by the pianist herself, who still is "alive and well in New York City." Bianca was a child prodigy who studied at Mannes and at Curtis. Her debut at Carnegie Hall came in 1950, and her long career also has included "Music Minus One" recordings, and producing LPs (not just in the classical genre) for CBS Records' "Columbia Special Products" series. The Massenet and Field concertos are not as well known as they deserve to be. Massenet is remembered as an opera composer, of course, but his piano concerto is very idiomatically written for the piano, and it mines the same vein of charm that Saint-Saëns accessed in his five piano concertos. A very serious first movement is followed by a prayerful Largo, and to bring the concerto to a close, there's an Allegro finale based on "Slovak Airs." The almost frivolous mood, however, speaks more of Paris and a great night on the town than Eastern Europe. Massenet's "Slovak Airs" are answered by the "Scottish Airs" in the middle movement of Field's concerto. (The movement is subtitled "Within a mile of Edinburgh town.") This Dublin-born virtuoso came one generation before Chopin, and, at least to a degree, blazed the trail that Chopin was to clear. (It was Field who laid the groundwork for the solo piano nocturne, for example.) While Chopin went west – from Poland to Paris – Field went in the other direction, ending his career in Czarist Russia. 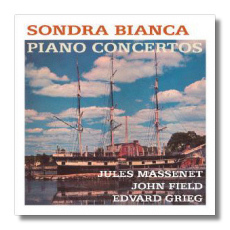 Bianca was the first pianist to record Field's concerto, and she must have been one of the first – if not the first – to record Massenet's. Bianca blends strength, agility, and grace in the correct proportions, and there's an element – forgive the phrase! – of "feminine intuition" in her understanding of the music's stylistic requirements. The monaural sound is a bit dull, but still very serviceable. In the Grieg, the competition is formidable, and Bianca's playing is, once again, very classy, with plenty of heft for the concerto's big climaxes, and also plenty of poetry when required. Here, however, the piano's tone is hard, there is some distortion, and the music doesn't rest as comfortably under Bianca's fingers as in the Massenet and the Grieg. It's not a bad recording – and it is in stereo - but it is not as distinguished as the rest of the CD. It's back to Hamburg for a recording of Dvořák's second most popular symphony. (If only it had had a nickname!) The coupling of Mackerras' Hamburg reading with Perlea's recording from Bamberg (once on Vox) invites a compare-and-contrast essay, but really, the two conductors are on the same page with their respective interpretations, and their orchestras have a similar sound. (The tonal blend in Bamberg is better than in Hamburg, but that might have more to do with the engineering – specifically, the microphone placement – than anything else.) Mackerras, who subsequent decades have established as a specialist in Czech repertoire, is more brilliant and animated, although Perlea is significantly perkier in the third movement. Perlea, on the other hand, is more affectionate, and when the music laughs, he laughs right along with it. (Listen, for example, to the giggles at the end of the third movement.) Mackerras gets the brasher engineering, and there is some pre-echo here as well. Reel-to-reel tape was used as the master for the Perlea; the Mackerras was taken from the Checkmate LP. Between the two readings, I'd choose Perlea's, although both conductors clearly adore this symphony – as well they should – and many a conductor in the year 2005 could take lesson from either Mackerras or Perlea about putting personality in their musicianship. As with other Rediscovery releases, this is a CD-R, and the packaging is minimalist. CD-Rs will play in most machines that play CDs, although there are a few holdouts. If you encounter any problems, ReDiscovery will make good. These discs are available from the ReDiscovery website (www.rediscovery.us) for $15 each, which includes shipping.